Bird can be a lovely pet. Unlike any other pets, bird often has nice voice to listen to. Cockatiel is a docile bird with nice voice that has many advantages to keep cockatiel as pet. However, just like any other type of birds, the wild one is a challenge to tame. Cockatiel has the tendency to be attracted to shiny things. Moreover, they can be sensitive to movement from stranger. Even though small in size, its bite can leave a sting enough for you to feel pain. Thus, as an owner, you will need to know how to train cockatiels not to bite the owner. Here are some steps to tame cockatiels so as to not bite you. Since cockatiels are attracted to shiny things, it is best to remove any jewelry on your hands. Those jewelries include ring, bracelet, and any accessories on the upper half of your body like earring and hair piece. This is especially important when you touch a cockatiel for the first time. Not only stranger alerted them, the jewelry worn will only attract their attention and resulting to bite you. However, if a cockatiel is getting used living in a house, it can stop this biting habit. Beginners tend to feel uneasy when their cockatiel is aggressively biting people. In order to calm them, they offer food to the bird. However, this is not a really good way to train your cockatiel not to bite people. The bird will see it as a positive action in order to get reward. As a result, it will keep biting to ask for reward or food. Instead of letting this habit to continue, ignore the request whenever it tries to bite you. Do not give food or toy when cockatiel starts to behave aggressively. Hence, your cockatiel will stop biting by knowing it makes you upset and you do not give reward for it. Aside from getting attracted to jewelry, there can be other reasons why a cockatiel keeps biting you. To be able to solve this problem, you will need to find out the reason why. There are some possible reasons that you can predict. The first is, the cockatiel feel scared of the new environment, it feels strange to its surrounding and anxious or you may need to keep cockatiels in pairs. The second one, still related to the first reason, is an act of self-defense. Your new cockatiel may see your hand as an act to shoo it away. As it gets threatened, it will start biting you. Once you find out the reason, you will be able to apply how to train cockatiels not to bite the owner with a more efficient way. Start by testing every reason stated and see how your cockatiel reacts to it. Even though ignoring it can work as well, you can also help your bird to understand why it should not bite by telling your cockatiel “no”. At first, you may get startled and instinctively want to scold or react angrily. However, if you react angrily, it will be even harder for you to get close to your bird. 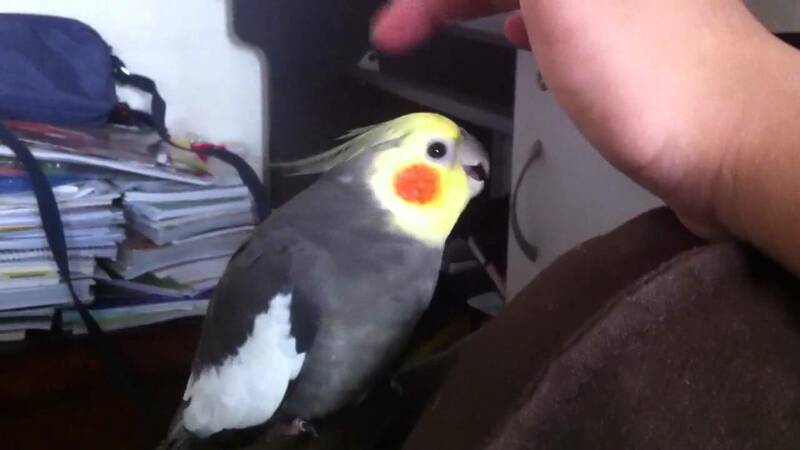 Instead of raising your voice, tell your bird sternly by saying “No” and shake your forefinger to show biting is a prohibited action. By doing so, the cockatiel will learn not to bite its owner anymore. For relatively young cockatiel, it may take time for it to understand your command; however, if you keep being patient with them, the bird will eventually understand. Another way to help training your cockatiel not to bite the owner is by clipping your cockatiel’s wing feathers. Why does this action help? The reason is young cockatiel, especially male ones, feel more comfortable and at ease when they got their wing feathers trimmed. It makes them feel more groomed. Male cockatiels are also easier when you want to train cockatiels to sing fluently. Moreover, when a cockatiel is feeling calm, it is less likely it will bite the owner. Calm cockatiel will not feel agitated easily. Well-groomed one in particular, feel confident and easy on it, thus will not see the point of biting human. It is important for new owner to get closer to the cockatiel. Creating bonding moment will help to improve bird-owner relationship. However, for first meeting, their biting may become unbearable. To avoid getting your relationship with the bird stifled, wear gloves for your few first meeting and learn few disadvantages of keeping cockatiel as a pet. Wearing gloves will protect your hand from cockatiel’s biting. Furthermore, your cockatiel may start to notice the glove once it gets close to you, and then refrain itself from biting you. Pull you gloves out once it stops biting to appreciate your bird even more. When the bird is still in biting phase, it is best not to let your cockatiel perch on your shoulder. As shoulder is near to your face, you can receive several biting and scratches from your bird. Not only you will get hurt from this close interaction, the bird is more likely to start flapping and decide to fly off. Only do some close gestures once you are sure your cockatiel is already trust you. When the bird stop biting only then you can advance a move to get closer by letting your cockatiel out and put them on your shoulder. Patience is the key since biting does not necessarily means your cockatiel is being hostile to you. By not react angrily and patiently keep approaching your bird in friendly manner, your new cockatiel will start warming up to you. Moreover, it is better to try to understand your bird first rather than immediately ordering it around. These are some ways on how to train cockatiels not to bite the owner. Once you able to do them, you can improve your relationship with your cockatiels. You may also want to learn other birds by get closer to bondol eagle.